Looking For Dental Implants Frederick MD? You’ve come to the right place! 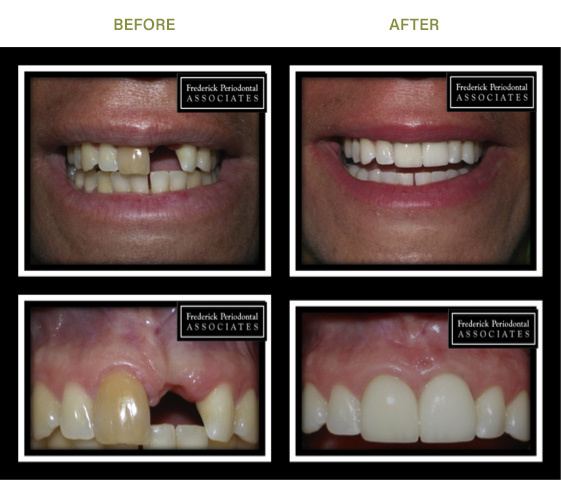 Frederick Periodontal Associates specializes in dental implants frederick md. A dental implant is an artificial tooth root that is placed into your jaw to hold a replacement tooth or bridge. Dental implants may be an option for people who have lost a tooth or teeth due to periodontal disease, an injury, or some other reason. Esthetic Case / Crown Lengthening: Example of gum lift and new crowns to correct gummy smile and old stained veneers. Dental implants are intimately connected with the gum tissues and underlying bone in the mouth. 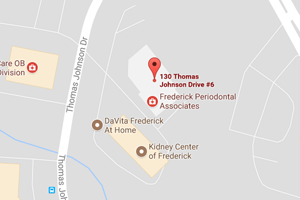 Since periodontists are the dental experts who specialize in precisely these areas, they are ideal members of your Frederick dental implant team. Not only do periodontists have experience working with other dental professionals, they also have the special knowledge, training and facilities that you need to have teeth that look and feel just like your own. Your dentist and periodontist will work together to make your dreams come true. This procedure is a team effort between you, your dentist and your periodontist. Your Frederick dental implant team will consult with you to determine where and how your implant should be placed. Depending on your specific condition and the type of implant chosen, your periodontist will create a treatment plan tailored to meet your needs. Sinus Augmentation Sometimes the bone volume in the upper back areas is insufficient to place implants due to the sinus position. We can “stretch” the bone through a sinus augmentation procedure that allows the necessary bone volume for an implant in this area. After treatment, your periodontist will work closely with you and your dentist to develop the best care plan for you. Periodic follow-up visits will be scheduled to monitor your dental implant, teeth and gums to make sure they are healthy.